12 March 2015. Exhaled particles from electronic cigarette smokers contain nicotine and other chemicals that could pose health risks to non-smokers in the same room, according to new research. The study, by RTI International, a research institute in North Carolina, aims to provide more health information about the largely unregulated and growing e-cigarette market. E-cigarettes are battery-powered nicotine delivery devices, that heat a liquid containing nicotine, moisturizing agents — propylene glycol or glycerol — and flavoring agents, as well as preservatives and artificial colorings. Makers of e-cigarettes often market the devices as safer alternatives to tobacco-burning cigarettes and sometimes as a technique to help tobacco smokers quit conventional cigarettes. 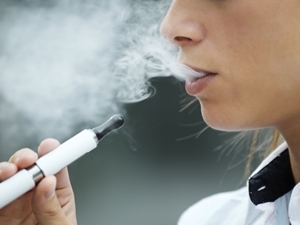 The RTI study notes that sales of e-cigarettes grew rapidly in recent years, with sales doubling in 2013. In May 2014, the market research company Nielsen estimated that annual sales through all retail and online outlets, including convenience and specialty “vape” stores — could be as high as $2.5 billion. At this time, the U.S. Food and Drug Administration only regulates on those e-cigarettes marketed for therapeutic purposes. The RTI team, led by physicist and engineer Jonathan Thornburg, sought to better understand the impact of e-cigarette emissions on people in the vicinity of people where the devices are used. The authors note that vapors and exhaled emissions produced by e-cigarettes have a different chemistry than tobacco smoke, so the team devised different measures for their effects on people and things where e-cigarettes are used. The result was a model to calculate second-hand exposure to e-cigarettes based on device technology, properties of aerosol and gases produced, exposure source as well as route and concentration, and characteristics of the vapor dose. The researchers estimate that about half of the vapors from an e-cigarette are exhaled, with the warm, moist environment of the lungs providing an extra aerosol effect. Depending on the number of e-cigarette smokers and their proximity, the researchers say aerosol concentrations can range from 10 to 10,000 micrograms per cubic meter. Nonetheless, they found aerosol particles to be smaller than 1,000 nanometers, similar to particles emitted by tobacco or diesel smoke. In most of their tests, particles from vaporized liquid tobacco were closer to 100 rather than 1,000 nanometers. In addition, the team found the same chemicals going into e-cigarettes are well represented in the exhaled emissions, including nicotine and the moisturizing agents propylene glycol or glycerol. Propylene glycol is associated with skin and eye irritation, according to CDC, as well as headache and nausea. Glycerol is also an irritant to skin and eyes, as well as the respiratory system when inhaled. Other effects, according to CDC, are headache, nausea, vomiting, and kidney injury.